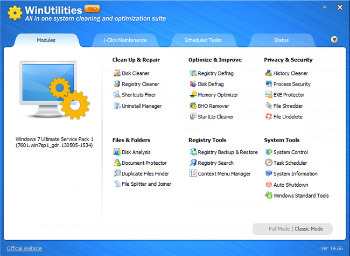 WinUtilities portable is an award winning collection of tools to optimize and speedup your system performance. This suite contains utilities to clean registry, temporary files on your disks, erase your application and internet browser history, cache and cookies. It also supports to defragment your disk drives and improve computer performance and stability. Built-in StartUp Cleaner allows you to control startup programs that load automatically with windows, find duplicate files, fix broken shortcuts and uninstall unneeded software. Other features include secure file deletion, recycle bin shredding, system maintenance tasks scheduling and undelete deleted files. WinUtilities Pro is a system tweaking suite that includes more than 20 tools to improve and tweak your PC’s performance. It offers an attractive and easy to use interface that organizes all tasks into categories and provides graphical statistics whenever possible. The tools include Junk File Cleaner, Registry Cleaner, Memory Optimizer, System Information, Registry Backup, File Encryption, Safe Uninstaller, Duplicate File Finder, File Shredder and much more. WinUtilities also includes an Internet Tracks Eraser with Cookie Manager and Secure Deletion. Overall, a great bundle that offers a wide range of system tools with extra benefits which are not easy to find.